In June while driving into San Francisco I got caught in a huge traffic jam. 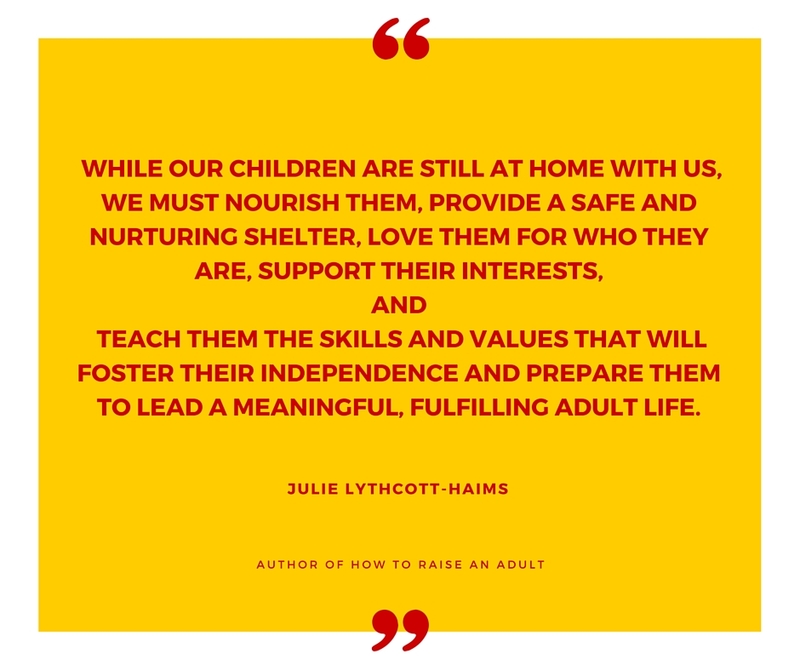 I fiddled with the radio, finally getting a signal for KQED and began listening to an interview and call in session with Julie Lythcott-Haims, former Stanford dean of freshman and author of How to Raise and Adult, Break free of the over parenting trap. It was one of those fist-shaking and shouting at the radio sessions that had other drivers giving me the “you are scary” look as they changed lanes. There were so many things I wanted to add to the conversation, but I haven’t learned how to drive and make my phone do things for me at the same time. I detest the blame the victim, “kids these days…” diatribe, when parents/adults don’t take any responsibility for situations they have helped to create. I’m frustrated with the lack of awareness that the K-12 system which typically requires compliance rather than self-direction does not help our children become independent thinkers and doers. The predominant cultural belief that raising children to get into college is the ultimate goal in life. There are options and alternatives to college. College is just a small part of life. I want us to raise children and adults who want to continue learning whether or not they are in a classroom environment. In fact I want people who are paying attention and learning all the time. Having our kids do chores, learn life skills, and be part of the family ecosystem as a contributor is hugely important, that school work should not trump living. That we need to stop parenting from fear, and love our kids for who they are, and give them opportunities to develop independence. The three hundred and sixty eight page hardback is comprehensive, weaving in Lythcott-Haims experience and observations along with research and interviews. She makes a case for what we are doing wrong and what we need to do instead. Take a look at the table of contents to see how she breaks down the topics. To me, one of the most compelling insights in the book came toward the end of Chapter 21, Reclaim Your Self. A case study is presented earlier of a family who dealt with a child’s addiction, attempt at suicide and recovery. The chapter revisits an interaction of the mother Leah, with founder Harriet Rossetto of the Beit T’shuvah Treatment Center. How many times have parents told me they just want their kids to be happy. How many times I’ve said that! Rosetto advises that the goal of a kids happiness is actually a dual burden, negatively affecting both child and parent. “Th whole famly system has to change,” says Rossetto. “The child is addicted to pleasure seeking. The parent is addicted to controlling the child’s choices and behaviors and creating a perfect human being, so their emotions are a mess. If the child is having a good day, Mommy and Daddy are happy, and if he’s not having a good day, Mommy and Daddy are in despair. Severing that umbilicus is what our family program does. A parent’s well-being can’t be dependent on whether or not the kids is having a good day. Navigate difficulty so they can learn to solve problems. Experience all their emotions so they can learn to deal with unhappiness. Be sure to separate parental and child happiness. As the parent, work on yourself and model taking care of pursuing your interests, living your values and managing your and emotions in a healthy way. On Lythcott-Haim’s website you can find a ten question discussion guide PDF and a page showing her upcoming book tour dates. I am planning to attend the December 2 date hosted by Davis Parent University. I encourage you to check the dates as you might learn about some interesting parent education discussions and groups that you didn’t know about. Or you could plan your own discussion with friends. Have you read the book? Did it resonate with you? Which aspect? Do you feel over parenting is a problem in general? For you? What do you feel is your biggest pressure or difficulty in deciding how to help your child? What steps do you think we can take as individuals and in our communities to get back to a ” more healthy and wisely loving approach? Please add your voice in the comments! Thanks, Lisa. Books = counselors, teachers, friends. What are you reading?